The Oregon men’s basketball team finished the regular season with its fifth straight win in a hard fought 65-62 victory over Oregon State Wednesday night at Gill Coliseum. The Ducks improve to 23-8 overall (13-5 Pac-12), earning a first round bye in the Pac-12 tournament, standing just one game behind second place Utah in conference standings. The Beavers (17-13, 8-10), under first year head coach Wayne Tinkle, finish the regular season below .500 in conference play. 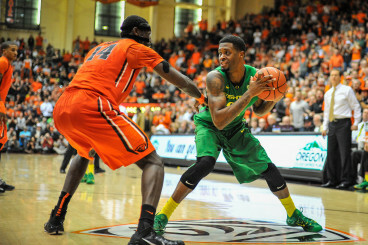 Elgin Cook led the Ducks with 17 points in victory over the Beavers. The Ducks overcame a Beavers squad that includes five walk-ons with strong offensive performances from their veteran players. Junior Elgin Cook led Oregon with 17 points and senior Joseph Young added 15 points, six rebounds and six assists. Senior Jalil Abdul-Bassitt had 12 points and two steals. After the Ducks jumped out to a 8-0 start, the Beavers’ shooting heated up as they eventually led the Ducks 28-19 with 5 minutes in the first half. But in typical fashion, Young answered with 8 straight points, leading to a 32-32 tie game at halftime. Both teams exchanged leads throughout the second half, only to deadlock again, 52-52. With 3:48 left, Oregon freshman Dwayne Benjamin hit a three pointer, and a subsequent OSU turnover led to a quick layup by freshman Dillon Brooks. Benjamin finished the game with 12 points off the bench. A much improved and energized Ducks’ defense seamlessly alternated between press coverage and man-to-man throughout the matchup. The Ducks’ dynamic freshman Jordan Bell had 9 rebounds, 3 steals, and two blocks, submitting another inspired performance on the defensive end for the Ducks. Bell continues to add to his new Oregon record with 81 blocks on the season. Dwayne Benjamin continues to contribute points off the bench. After the game, Young said he was encouraged by his team’s ability to recover from mistakes and keep playing hard despite facing adversity. “We make mistakes on ourselves. It’s part of the game. We didn’t give up. 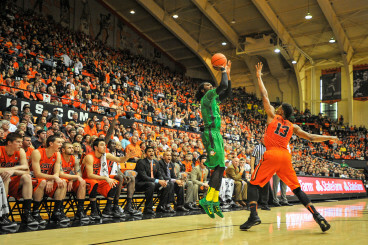 This team is really coming along, but coach [Altman] is right, we could do much better than we are doing,” Young said. 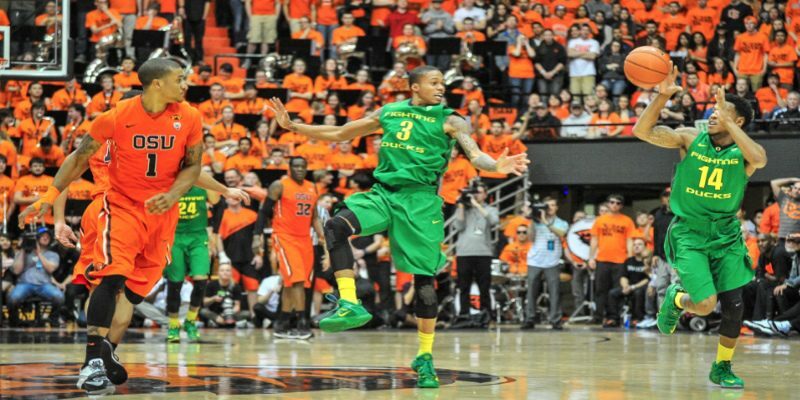 Young has amassed a total of 1,242 points in his two seasons with Oregon, second only to former Oregon guard and NBA all-star Terrell Brandon. After a long and successful road series to finish the regular season, the Ducks are almost certainly guaranteed an outright invitation to the NCAA tournament and will enjoy some much needed rest before the Pac-12 Tournament in Las Vegas. The Ducks will play in the second round of the conference tournament on Thursday, March 12th.